The Western Australian Department of Mines & Petroleum have issued a reminder to companies of the requirement to ensure that used vehicle batteries are transported safely and in accordance with the Dangerous Goods Safety (Road and Rail Transport of Non-Explosives) Regulations 2007 for WA. Lead acid batteries, as used in most motor vehicles, retain a dangerous goods classification as Class 8 Corrosive articles even after they have been used. DMP Senior Dangerous Goods Officer Stephen Lane said “some companies were unaware of the safety requirements”. 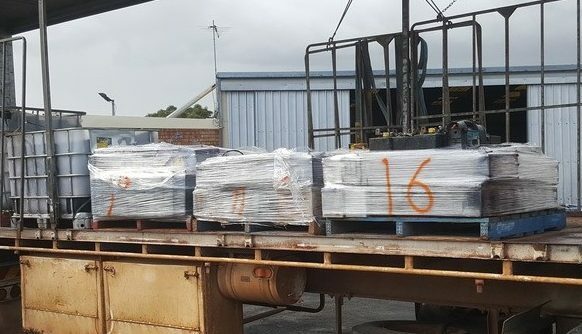 “The department is aware of a number of situations where used lead acid batteries have been transported without dangerous goods transport documentation or adequate over-packing and restraint,” Mr Lane said. Companies are also reminded of the “Chain of Responsibility” legislation introduced into WA transport laws on April 2015. The law means that consignors are a party in the “chain of responsibility” and may be deemed liable in the event of a breach of the road laws or an accident. Companies failing to ensure their lead acid batteries are being transported in accordance with the Dangerous Goods Safety (Road and Rail Transport of Non-Explosives) Regulations would be in breach of this law. The law also extends to company directors, employers, unincorporated associations and partners in a managed partnership. Further details of MainRoad Western Australia’s “Chain of Responsibility” regulations can be viewed on their site. Battery Rescue suggests to companies that if they are unsure whether they are meeting all the regulations governing the safe storage, handling and transportation of used lead acid batteries, that they can contact Battery Rescue for advice.